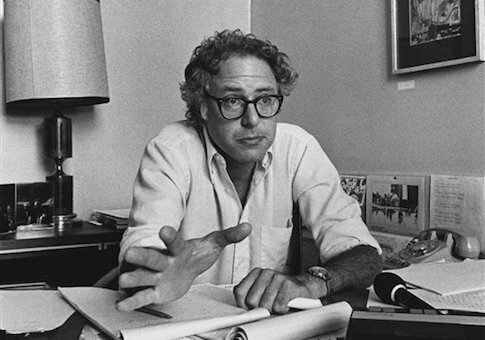 Sanders came to the farm while researching an article on natural childbirth for the Liberty Union’s party organ, Movement. Interest in alternative medicine was strong among members of the counterculture as part of their wider suspicion of modern science, which was associated with the sterility of hospitals and the destruction of war. "Many elements of Western medicine came under suspicion during this period, but none more so than modern obstetrics," Deloz writes. In Sanders’ article, previously digitized by Mother Jones, he criticized old methods of childrearing, where "infants were bottle fed on assembly line schedules designed by assembly line doctors in order to prepare them for assembly line society." In Sanders’ view, natural childbirth was a step toward a more authentic society. "All of life is one and if we want to know, for example, how our nation can napalm children in Vietnam—AND NOT CARE—it is necessary to go well beyond ‘politics,’" he wrote. Sanders’ prefatory remarks were followed by a Q&A between him and a friend, Loraine (spelled "Lorraine" in the article), who had recently given birth to a baby, Rahula (spelled "Rahoula" in the article), on the Myrtle Hill commune. According to the forthcoming book, Sanders "gently peppered [the mother] with questions in his thick Brooklyn accent" about her experience with natural childbirth. During labor, Loraine said she was surrounded by a circle of hippies chanting "a meditation mancha" that "seemed to really bring in good energy." This group included "the couple of men who were potentially the baby’s father," according to Deloz. When Rahula was delivered at dawn, "someone ran out into the field and blew a long blast on a hunting horn." Loraine then ate her afterbirth, a detail that does not appear in the book, but that appeared in the second part of Sanders’ essay. When not reporting on the miracle of life, Sanders spent his time at Myrtle Hill in "endless political discussion," according to Deloz. Sanders’ idle chatter did not endear him with some of the commune’s residents, who did the backbreaking labor of running the place. Daloz writes that one resident, Craig, "resented feeling like he had to pull others out of Bernie’s orbit if any work was going to get accomplished that day." Sanders was eventually asked to leave. "When Bernie had stayed for Myrtle’s allotted three days, Craig politely requested that he move on," Daloz writes. Deloz does not specify what issues Sanders discussed with commune residents, but earlier passages give the general flavor of political discussion at Myrtle Hill. "There were bigger ideas under discussion too: a kibbutz-style school for commune children; the possibility of a coming violent revolution; and the pros and cons of group marriage." In another passage, Deloz describes how one commune resident led the children on marches, chanting "Ho! Ho! Ho Chi Minh! Vietcong is going to win!" The Myrtle Hill commune lasted into the 1980s, but some of its idealism had worn off by the end. Deloz describes how the residents unwittingly drifted into patterns of life that they had hoped to reject, with traditional gender roles and monogamous relationships—"Free Love turned off like a faucet." The commune was ultimately a casualty of the War on Drugs. One of its residents, Jed, ran a sophisticated marijuana grow operation to supplement his farmers’ income. When the authorities descended on the land in the mid-1980s, they found nearby a quarter million dollars of marijuana and a small arsenal of weapons, including "a bullet-proof vest, a machete, a gas mask, and a fully loaded Uzi." There is no evidence Sanders took part in the later activities of the commune, and it is unclear if he returned to the commune again after his 1971 junket. The book’s promotional materials mention that Sanders "was a frequent visitor to Myrtle Hill," but the book only mentions the 1971 visit. The Sanders campaign did not respond to questions about the candidate's ties to Myrtle Hill Farm.